The M'bashe lighthouse lies on the wild coast, part way between East London and Port St Johns. It was back in 1890 that the Cape Colonial Lighthouse Commission, originally recommended putting up a few beacons on the coast east of Port Alfred. And a beacon was finally erected on a hilltop just west of the present lighthouse at M'bashe in 1892. Known as M'bashe lighthouse, it remained standing until it was demolished in 1944, although a few remains are still evident on the road. 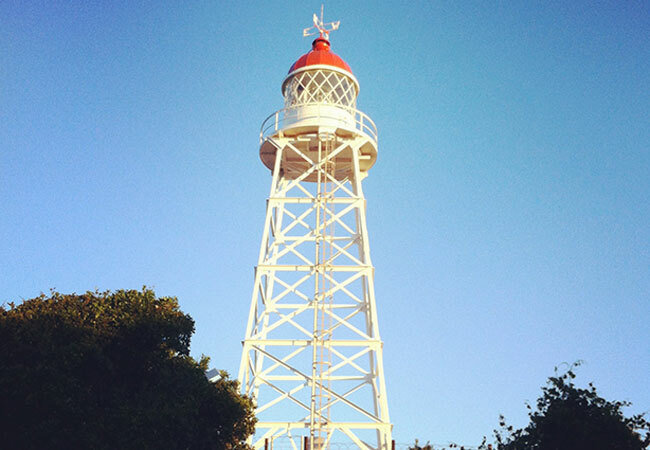 Today's lighthouse is a lattice steel structure roughly 250 metres away from the original lightkeeper's house. It converted to electric power in 1962, but the original tower is still in use, its little red dome a beacon of colour against the blue of the sky. It was an isolated post for a lightkeeper particularly as the nearest town was Umtata, even if a bus operated between Bityi station and the lighthouse twice a week to bring provisions. Post came to the families stationed here from Elliotdale, a little village about 40 kilometres away. With independence in 1976, Transkei replaced the solitary lightkeeper with one of their own. This part of the coast was particularly popular with fishermen as there was some good Kob to be caught, particularly off the rocks in the vicinity of the lighthouse. However, most of the area is now a Marine Protected Area and no fishing is allowed. The Mbashe River, so popular with fishermen, separates two little nature reserves – the Dwesa and Cwebe.